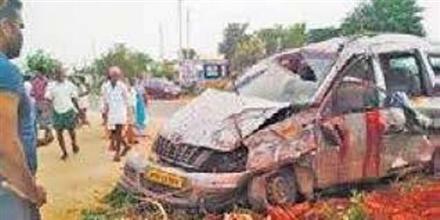 Vijayawada Six members of a family were killed and 15 others injured in a road accident in Andhra Pradesh’s Kurnool district early on Wednesday, police said. The passengers travelling in an auto trolley which was hit by a truck from behind near Peddahutur village. The family was on their way to a ‘dargah’ at Eltari for a tonsuring ceremony of a newborn when the accident occurred. According to the police, 21 people were travelling in the vehicle. The dead include three youth, two children and a woman. The injured were admitted to a government-run hospital in Kurnool. Chief Minister N. Chandrababu Naidu directed officials to provide best treatment to the injured.